lately i have been hearing the same question over and over again: HOW do you always find these good deals?? i really take my time when i browse through the racks. i have said it before and i'm saying it again: i go through every rack, every size, because that's usually where all the hidden gems are. another tip is to try things on. even when they look weird or even maybe because they look strange on the hanger, they need to be tried on. today was another good find day!! 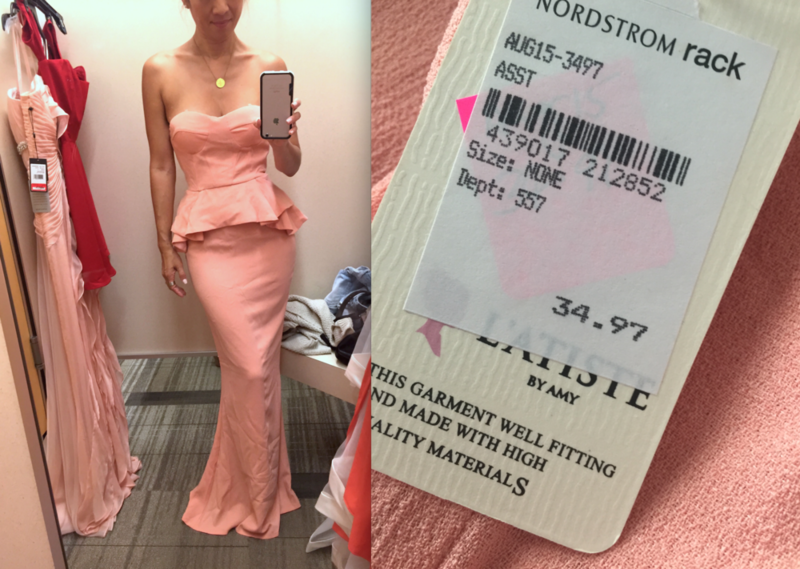 i found this very adorable blush coloured peplum dress that would be perfect for a bridesmaid or even just to wear it as a guest of a wedding. the only problem was, the straps were missing and since my chest couldn't fill out the top part of the dress i had to come up with an idea how to make it secure. i bought it, brought it home and started playing with it. this is what i came up with. i used a statement necklace from H&M i bought a while back and sewed itt to the dress rightat the edge of the cleavage area. then i cut two long matching satin ribbons and attached at them at both end. i secured them at the loops which was originally made for the straps.